I hadn’t done anything for breakfast on my community TV show. So, I decided I should do a classic breakfast, Biscuits and Sausage Gravy. 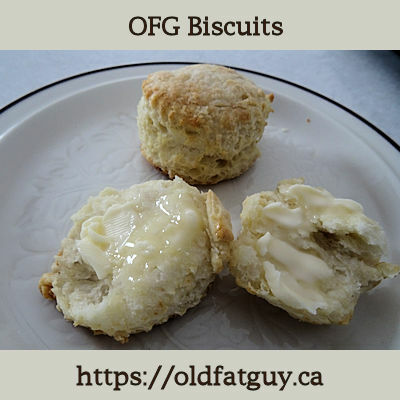 Of course, the first step was making OFG Biscuits. I preheated my oven to 450 F.
I put 75 ml (1/3 cup) of butter in the fridge to get keep cold. I put 40 ml (3 tablespoons) of butter in the freezer to get hard. It has to be in the freezer for at least 30 minutes. I grated the 40 ml (3 tablespoons) of butter through a cheese grater until crumbly and put the crumbs back in the freezer. I mixed the flour, baking powder and salt together. I put the vinegar in a measure and added enough milk to bring it up to 225 ml or a scant cup of liquid. I broke the 75 ml (1/3 cup) of butter onto the flour mixture. I used a pastry blender to cut the butter into the flour until it has the texture of coarse corn meal. I added the liquid all at once. I turned the contents over in the bowl with a spatula seven or eight times just to moisten the dry ingredients. It will not be totally mixed. Turn the bowl contents out onto a lightly floured counter and form it into a rectangle that is is twice as wide as it is tall and about 3/4 of an inch thick. Get the grated butter from the fridge and sprinkle 1/4 of it over the dough. Fold the dough in half over the butter. Turn the dough 1/4 turn and press to twice as wide as it is high. Repeat the procedure three more times to include all the butter. Press the dough out to 3/4 of an inch thick and cut circles out with a cookie or biscuit cutter. Put them on an ungreased baking sheet. You can form the remnants into two biscuits but they won’t be as light as the first roll. Cook for 12 to 14 minutes until golden and browned on the bottom. These are great biscuits! They have a nice crunchy exterior around a buttery soft centre. The perfect biscuits for Sausage Gravy! Grate the frozen butter through a cheese grater and put back in the freezer until using. Mix the flour, salt and baking powder together in a mixing bowl. Mix the vinegar and milk together. Break the cold butter into the flour and cut the butter in by rubbing with your fingers or using a pastry blender until the mixture resembles coarse cornmeal. Add the liquid all at once and turn the mixture over seven or eight times with a spatula. It will not be totally mixed. Turn the contents over onto a lightly floured counter. Form the dough into a 3/4 inch thick square that is twice as wide as it is high. Spread 1/4 of the grated frozen butter over the dough. Fold the dough in half and turn it 1/4 turn. Press the dough to twice as wide as it is high and repeat the procedure 3 more times to incorporate all the frozen butter. Press the dough to 3/4 inches thick and cut out circles with a biscuit or cookie cutter. 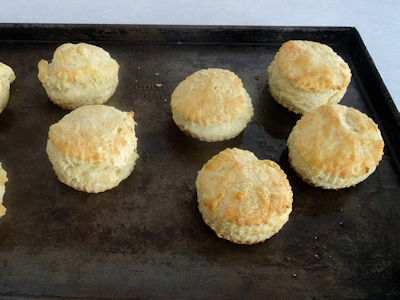 Put the biscuits onto an ungreased cookie sheet and cook for 12 to 14 minutes, until golden and browned on the bottom. Well, now I’m ready for some breakfast. Looks perfect for the sausage and gravy. I’ll be over tomorrow morning!!!! I’ll have the coffee on! These look like the perfect biscuit! We’ll be trying this one for sure.